The following article is an interactive article. Sources are not cited with footnotes, but presented as hyperlinks. Each source will open in the window as a JPG image when clicked on. Exact date and periodical is listed in the title of the image (eg. MOTIONPICTUREEXHIBITOR_071454.jpg is from The Motion Picture Exhibitor, July 14, 1954). John Wayne's western masterpiece HONDO (1953) has long been heralded by critics as one of "the Duke's" finest independent achievements. Shot on location in Mexico in co-operation with Warner Brothers, the film boasted many high-profile aspects. Aside from being Wayne's first self-produced color production, the script was written by James Edward Grant, a favorite of Wayne's, based on a story by the great western writer, Louis L'Amour. HONDO's cast also introduced Geraldine Page in a role which garnered her an Academy Award nomination. Besides John Wayne himself, HONDO's most important selling point was its stereoscopic photography. However, this significant aspect of HONDO's history has been grossly mis-stated in recent years, and it is time to finally set the record straight. In 2007, the company doing a digital restoration of the film claimed that it was photographed as a "color anaglyph." Major newspapers and well-respected industry trade journals have now perpetuated the myth that HONDO (and all other 3-D features from the 1950's) were originally shown in this inferior red/blue anaglyphic system. The truth is that HONDO was originally shown in polarized 3-D. 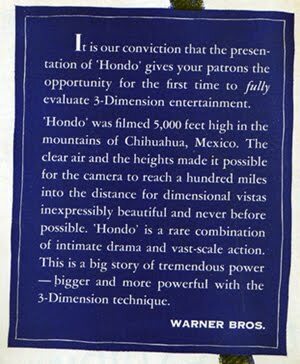 In fact, HONDO had one of the widest releases of any 3-D feature from the 1950's, playing the majority of its engagements in depth. According to a January 1954 article in Boxoffice Magazine, there were 5,000 theaters equipped to run 3-D motion pictures. From the cavernous 4,500 seat Fox Theater in St. Louis, to the cozy 300 seat LaBelle Theater in South Charleston, West Virginia, HONDO graced many of those silver screens in its third-dimensional version. The following article will present these facts documented with interactive sources. Searching for an alternative to draw audiences back to theaters from television in the early 1950s, studios and exhibitors alike put their efforts into realism productions and in November of 1952, stereoscopic movies made a big splash at the box office. Arch Oboler's African adventure, BWANA DEVIL opened to great acclaim, despite being generally considered a mediocre film. The public interest was not in what was going on in the film, but what was going on in the theater. Lions were leaping into the audience. There was an added dimension to the screen-- depth. Despite decades of experiments, short subjects and failed attempts at 3-D, BWANA DEVIL brought to the public an economic system of depth-realism. Oboler's production gained its notoriety from its use of the Natural Vision three-dimensional camera. Natural Vision operated with two cameras, focused at angles and distances imitating the two human eyes, recorded onto two separate negatives. In projection, utilizing Polaroid filters in front of two projectors in synchronization, the two prints struck from these negatives were projected onto a silver screen, where the audience member wearing special Polaroid glasses would then maintain an illusion of stereoscopic imagery in their sight. Word spread around town instantly of Oboler's financial success, and all of the major studios quickly went into production with their own 3-D films, either using the Natural Vision camera rig or devising their own. The most successful of these films was Warner's HOUSE OF WAX (April 1953), starring Vincent Price and also released in the WarnerPhonic stereophonic sound system. Jack Warner, so impressed by the financial success of the film, announced a rigorous schedule of 22 films in 3-D, representing half of the studios upcoming shooting schedule. 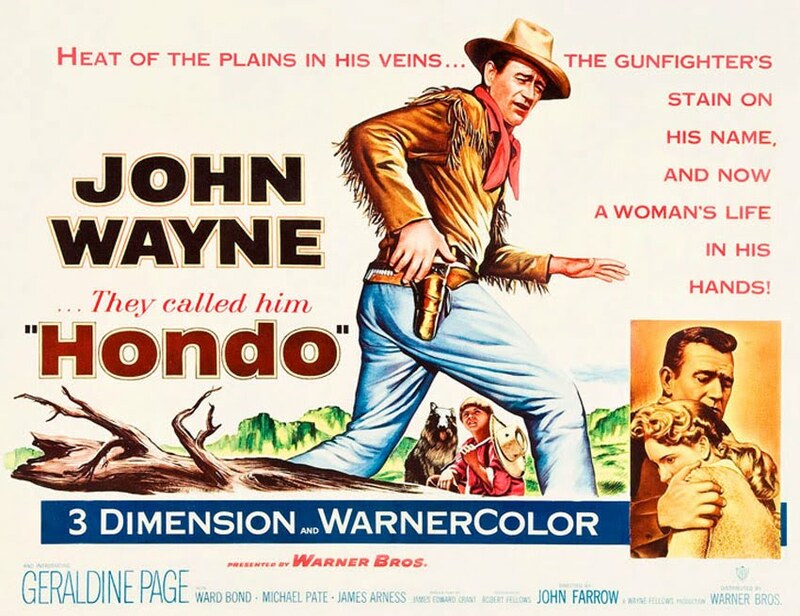 HONDO was slated to be Warner Bros. first widescreen movie. They had shut down the studio in April of 1953 for a period of evaluation and testing. Jack Warner announced the studios all-widescreen policy on May 7, 1953. On May 19, he presented the new All-Media Camera, a camera designed to shoot in any format-- black and white or color, 3-D and/or widescreen, or flat. 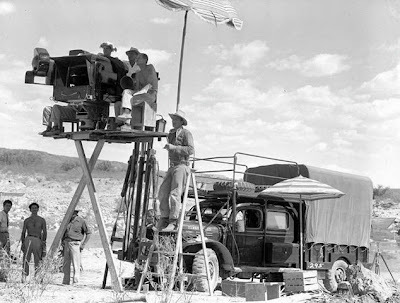 The rig was designed and built by the studios camera department, and would be utilized for the first time on HONDO. Cinematographers Robert Burks and Archie Stout would be shooting on location, in 3-D and widescreen. Films shot with the All-Media rig were composed for the aspect ratio of 1.85:1. Principal photography began in Camargo, Mexico on June 11. The picturesque landscape would provide the perfect visual setting, but the director and cinematographers had trouble adjusting to the new camera. On June 18, Jack Warner viewed three reels of dailies and was concerned about the lack of close-ups, especially in the scene where John Wayne first meets Geraldine Page. He sent a telegram to the Duke and said "Director is not moving you and Geraldine close enough to camera. Everything seems to be too far away. Must have usual over-shoulder close shots individuals and tight twos in three-dimensional pictures so we can see peoples expressions and everything else." On June 20, John Wayne replied: "Farrow has done everything but play music to get camera in for close shots. Seems our lenses are matted for 1.75 or 1.85 screen, plus fact that cameraman is over cautious for fear front office will scream eyestrain. Will show cameraman your wire. Think it will do the trick. He is really working hard but has limited us in making shots because of his fear and reluctance to do a shot that might throw background lines too wide an angle." Jack Warner's advice was taken, and Robert Burks started moving the camera in tighter for close shots. However, over the next several weeks, the elements proved to be a major problem. The intense heat, dust, wind and rain caused multiple delays throughout shooting. As a result, there are several shots in HONDO that are flat, due to a malfunction with one of the cameras. 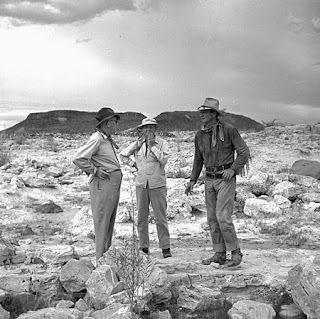 John Ford visited the location in Mexico. The popular myth is that Ford directed the climactic Indian attack because Farrow had to leave the shoot to begin another film. That's not true. Farrow was present for the entire production (which wrapped in early August) and his next film, A BULLET IS WAITING, began filming on December 7. John Ford was there to support Wayne and as a personal favor, directed two shots of the Duke seeing a troop of cavalrymen when he visits the army post. By the end of the summer of 1953, interest began to dwindle in 3-D, resulting in a quick decline of both productions and exhibitions. Projectionists were finding it difficult to maintain synchronization between the two reels of film running during projection, a malfunction that would cause severe eye-strain and headaches for the audience. Read What Killed 3-D? for more information. On September 16, 1953, 20th Century Fox premiered their anamorphic process CinemaScope with their production of THE ROBE. They wasted no time in advertising the new process as "the modern miracle you see without glasses." At the same time, several studios reversed their policy which had mandated that all 3-D movies must play their entire run of stereoscopic playdates before being available as a standard, flat film. With the studios' new attitude towards the exhibition format, most exhibitors opted to play the new 3-D releases flat. By November 1953, 3-D was considered poison at the box office. But 3-D movies weren't dead yet. Due to newly developed technical advancements in projection techniques, the studios began a new campaign to bring back 3-D, with their ace being a new group of quality, high-budget 3-D films that would outshine the competition. Among the Fall/Winter 1953 season's titles were Columbia's MISS SADIE THOMPSON with Rita Hayworth, Paramount's MONEY FROM HOME with Dean Martin and Jerry Lewis as well as Hal Wallis' timely Korean War docu-drama CEASE FIRE, RKO's scandalous production of THE FRENCH LINE with Jane Russell, MGM's film version of the Cole Porter musical, KISS ME KATE and Warner Bros.' highly anticipated John Wayne western HONDO. Metro Goldwyn Mayer decided to test public opinion: they would exhibit KISS ME KATE in six theaters. Three theaters would play the film flat, and the remaining three would show it in 3-D. The public's reaction would dictate which version would go into wide release. The 3-D showings had a substantially better response and KISS ME KATE went into wide release in either format, but with the suggestion that showmen across the country play the stereoscopic version of its film. With the exception of Radio City Music Hall, most other engagements for KATE were in 3-D. It was into this uncertain climate which HONDO first went into release. Jack Warner and his studio had been a staunch advocate of 3-D, and wasted no time in promoting their forthcoming release. The first trade ads appeared on November 7, and the film was trade-screened for the press on November 16, 1953. The reaction was sensational. Critics unanimously praised the film, and its effective use of stereoscopic cinematography. Warner Bros. was so enthusiastic about the films dimensional qualities, they made sure to emphasize that fact in their trade ads. In order to satisfy theaters not equipped for 3-D, Warner Bros. stated that HONDO would also be available in its flat version. With the official release date set for January, the studio assigned release #312 to the 3-D version, and #349 to the 2-D version. In an effort to ensure the highest quality presentations, the Polaroid Corporation (who obviously had a vested interest in the continued success of 3-D movies) developed and advertised new, comfortable plastic glasses and clip-ons as well as synchronization aids which would enable operators to quickly detect and remedy any out-of-sync 3-D presentation. Offered to theaters at a nominal cost, Polaroid did all they could to insure that the 3-D movie industry would last. They even took out special ads in local newspapers insuring the public that the 3-D to be seen in HONDO was better than anything they had seen before. HONDO had its world premiere on November 24, 1953. John Wayne and Ward Bond flew to Texas for the premiere in Houston, and then went to a second premiere on November 25 in El Paso. Warner Bros. announced a special group of pre-release playdates commencing on Thanksgiving Day, November 26, 1953, in thirty-five major cities, including Detroit, Atlanta, Boston, and Washington. Any fear that 3-D would hurt the films box office potential was quickly diminished as HONDO did terrific business wherever it played, and was held-over for a second (and even for a third or fourth week) in most engagements. Jack Warner even placed an ad in both the Hollywood Reporter and Daily Variety boasting to his peers (and critics) about HONDO's phenomenal success. The studios publicity department went to work and sent View-Master preview reels to camera shops and movie theaters across the country. The View-Master reel depicted seven scenes from the film, each in full color and stereoscopic 3-D. National Screen service provided the cabinets in which the reel could be viewed, complete with a silk-screened, die-cut card on top of the cabinet. As part of their rigorous ad campaign, Warners arranged for a television contest to be broadcast on the CBS program, "The Big Payoff." Despite a city-wide newspaper strike wherein there was no advertising available, HONDO still managed to perform an amazing $55,000 during its first week engagement at the 3,664-seat Paramount Theater in New York. The film was held over for three weeks during this play date, and at the Paramount alone grossed $128,000 in ticket sales. A smash hit on his hands, Jack Warner was quick to re-state his faith in the future of 3-D movies. HONDO continued to pick up box office steam throughout December, where it opened in such major cities as St. Louis, Los Angeles, Cincinnati, Portland and Minneapolis. In January, 1954, it opened in additional cities, including San Francisco, Chicago, Oakland, Denver, Seattle and Toronto. 3-D bookings maintained their popularity into February. In New York alone, it opened on February 3, 1954 at 31 theaters in Manhattan, the Bronx and Westchester. One week later, ten additional RKO-circuit houses in Brooklyn and Queens added stereoscopic showings. This pattern of second-run and small-town dimensional bookings was typical of the widespread interest and success of HONDO. Even many drive-ins, which because of technical reasons were not usually 3-D friendly, played the stereoscopic version of the film. 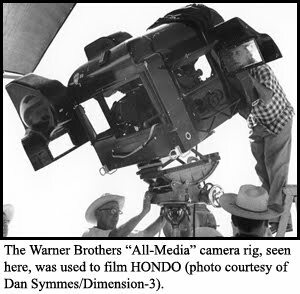 Despite Warner's announcement that any exhibitor had the option to play the film flat, it is interesting to note that until February 1954, all known bookings of HONDO were stereoscopic in every engagement. In fact, finding any flat bookings during this period proved difficult. One flat playdate was found at the sub-run booking of the 800-seat Belmont Theatre in Long Beach, CA, but only after having played two-weeks starting Christmas Day at the 1,800-seat State Theatre and the 1,200-TowneTheatre, both in 3-D.
March and April of 1954 found HONDO finally beginning to open at some small theaters and drive-ins which did not have the necessary equipment for stereoscopic exhibition, long after the 3-D version had played out its first-run engagements in that particular area. Even so, bookings in 3-D could still be found in such towns as Charleston, West Virginia and Winnipeg, Manitoba. 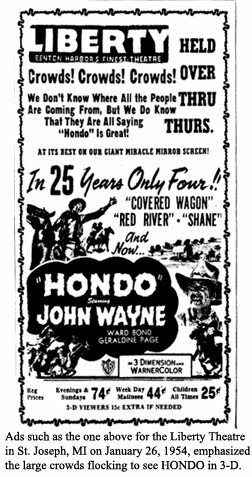 HONDO's 3-D success was not limited to the U.S. On February 27, 1954, it opened to capacity crowds at London's 1,734-seat Warner Theater, where it would play for five weeks and bring in over $40,000. Nearly three months later, HONDO was still playing in 3-D in theaters throughout South London. With an average price of 49-cents a ticket in 1954, HONDO finished up the year with an impressive domestic gross of $4,100,000, a very large percentage of those being stereoscopic playdates. In 1954, HONDO was the 16th highest grossing film of the year, and the 106th top grossing film of all time. After Warner's HOUSE OF WAX, which grossed an astonishing $6,500,000, it was the second highest grossing 3-D film of the 1950's.